Cartier Santos for Men from Slapiton Authorised UK Stockist. Cartier Santos For Men was Cartier's first fragrance for men. Cartier Santos For Men is a fragrance of modernity, created in the bold trail of the brilliant inventor Santos-Dumont. Cartier Santos For Men makes us discover new worlds and it expresses determination and elegance. 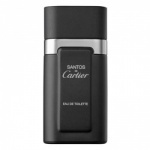 Cartier Santos For Men is an essential and heady fragrance. Cartier Santos is composed of verbena and basil top note, over a heart note of nutmeg, rosemary and geranium, which reveals this prelude to a voyage in warm and intoxicating shores.The intensity of the fragrance continues in the end note with the woody accord of sandalwood and a touch of patchouli and vetiver. A woody perfume that dares to risk an excess of aromatics with the freshness of basil and the amber notes of clary sage, underlined by the elegance of cedar wood.